Autophagy is an orchestrated homeostatic process to eliminate unwanted proteins and damaged organelles. The autophagic process is also used to remove intracellular microbial pathogens. Several signaling pathways sense different types of cell stress, ranging from nutrient deprivation to microbial invasion, and converge to regulate autophagy at multiple stages of the process. mTOR is a major negative regulatory axis of autophagy. Direct inhibitors of mTOR and those of pathways activating mTOR, subsequently induce autophagy. In addition, Beclin1 is negatively regulated by caspases, the inhibitors of which act to promote Beclin1 action to induce the initial stages of autophagy. Furthermore, inhibitors of the 26S proteasome and the epigenetic regulators, histone deacetylases and DNMTs, result in the increase of Atg and LC3 proteins levels essential to the process of autophagy. 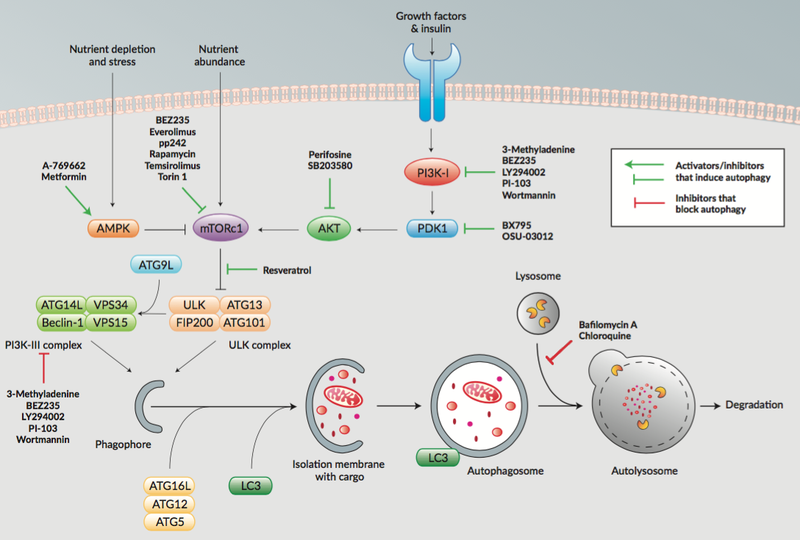 InvivoGen provides inhibitors that target molecules involved in these pathways that can impact autophagy and can be used to study autophagy in cells.